Summer is around the corner. Really. I promise you. 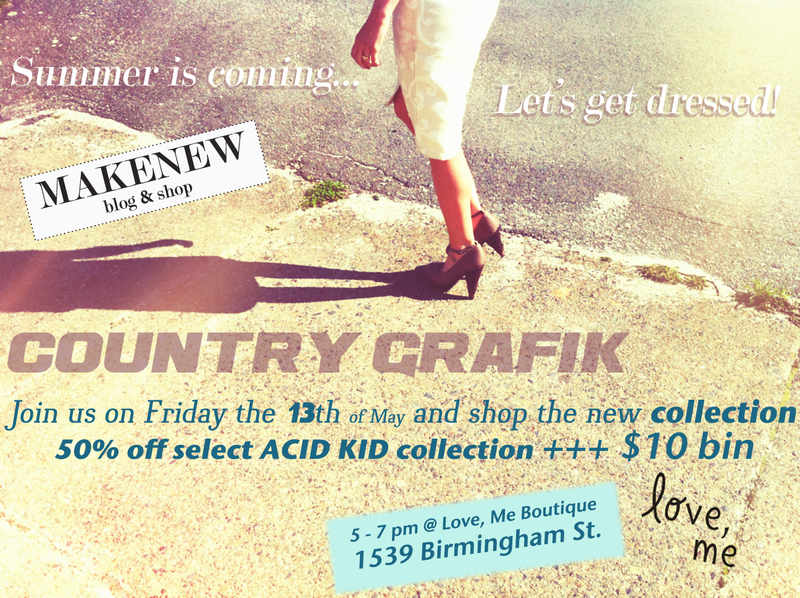 Love, Me Boutique & Make New are keen to make you summer wardrobe ready. The Let’s Get Dressed pop-up shop event presents COUNTRY GRAFIK: A young woman revisits her grandmother’s forgotten estate. Join us Friday May 13 5-7 pm and find vintage fashion treasures perfect for roaming antique laden estates: 70’s & 90’s inspired silhouettes, heavy contrast graphic prints, subtle sailor inspired pieces, and silky chiffon blouses and dresses in prints & solids. This summer is bound to be full of mystery and exploration. Pull off your best Nancy Drew in stretch cashmere knit pencil skirts, high waisted shorts with front tucks in denim, heavy cotton and corduroy. Lounge in country estates in sheer & pale layered slips, night dresses, camis & blouses while light weight cream & ivory sweaters are perfect for layering on cool summer nights spent drinking late night cocktails on the porch.